﻿ Interview with Daniel Ravner: Creating "TV by the People"
MIPBlog: How did you come up with the idea for TV by the People? TV by the People started when we said “alright, let’s do it” and once we were committed the project mechanics lined up. Once we recruited Lior Zoref, a crowd wisdom researcher, the right questions came up which were followed by the right answers and it took off fairly quickly: to get from inception to a finalised crowdsourced mini bible took six months. > What is the show’s actual pitch? The call to action asked people to provide a five-line idea for a TV show. We then chose the finalists’ ideas based on what we thought had the most potential. The idea that got everyone going came from an Irish architect called David Sheridan, and it was about dropping people at a certain geographical point and seeing how far they can get from that point within 48 hours (and the prize being a result of that distance). Since then, the premise was altered and the show developed to include innovative social media involvement as part of the race, but it was that core notion that got us going. > You sourced nearly 900 idea submissions. How? What promotional methods were the most effective? We received 1420 participants and 841 ideas (resulting in a development group of 580 people from four continents) and we managed it thanks to our ability to change our marketing strategy twice a week. We tried an approach, evaluated it, kept what was working and changed the rest. The project was a first in many ways and it was true to the marketing as well. We had some ideas on how to approach the world, but no experience to draw conclusions from. In the six weeks of marketing, we did PR, we approached hundreds of bloggers and relevant community managers personally, and we’ve published banners and text ads on Google, Linkedin and Facebook. We also created a video to boost submission on the last week (below), and shared it via social networks. We didn’t spend a lot of money on the sponsored campaign but with the help of our team, we reached many influencers. We learned that PR was most effective in bringing people in, followed by Facebook and then Google. We learned that the same exact ad will bring more leads if it offered participants to take part in TV history (even more than if it was offering a prize), we learned (to our surprise) that a general campaign was more effective than an interest based one. And we also learned that the landing page at www.tvbythepeople.com (below) had to be “hard-sell” with more images and less text (we changed it a few times during the marketing phase). > How did you attract a partner like (Ireland’s) Screentime Shinawil? Are any others in the pipeline? Screentime Shinawil were in it from the get-go. They have been working with Armoza Formats for years, and I personally know Larry Bass from the Entertainment Master Class. As we share a passion for innovation, we discussed this and other digital concepts throughout the years. When TV by the People took off and took shape, it was just matter of time until the partnership became official and the guys from Ireland became full partners in the initiative. Obviously, just by joining us, the potential and feasibility of the format grew, especially given Shinawil’s background in large-scale event television. > What surprised you most about how the project went? Most surprising was just how engaged the group became the more the development itself advanced (over the six weeks of development). Group members created graphs and analysis to discuss format elements; they initiated a process of visual crowdsourcing perfecting a visual vision for the show; they created maps of how would a local production will deploy; they created trailers and even wrote songs. It got to a point where I would pose a new question (for example: “what if there is no winner?”) and it would explode with ideas and discussion in a matter of hours. As we had several time zones in the community, this would go on day and night. > What was the most challenging part? Most challenging was making clear decisions based on this outpour of creative input. Each thread posed a question and for the format to advance to the next element, we had to decide what goes in and what stays out. Though we were part of the discussion, always navigating it to effective horizons, we still had to go over a lot of comments, making sure we considered everyone’s opinion, and then making choices, usually under time pressure. > What were the key learnings? – People are in it for the community, for the spirit, for fun. Giving them real value and meaning goes much further than prizes (we did both). – At some point you have to spend money on marketing. You can’t just rely on you social media organic effort. – The crowdsourcing itself has to be very structured. Precise questions that require relatively short answers (a few lines at most). – There’s a limit to how much you can “manage the effort”. You have to be present and part of the community, available to respond and making sure everyone’s efforts are acknowledged and on point. 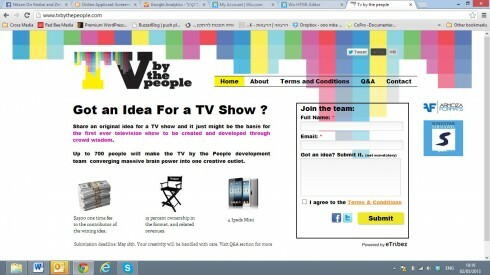 > To what extent would you say crowdsourcing is the future of TV? Television in the digital age is constantly looking to engage in dialogue with its viewers. Crowdsourcing is the highest form of that dialogue because it affects changes on the screen. It also allows people to express themselves, which is a much stronger motivation for any activity on social networks (than, say, vote for your contestant on a talent show). So it’s a great content and marketing tool and this why we also created a product from the process itself (selling the knowhow of TV-related crowdsourcing). A broadcaster can use the same process to get a mission for a new season of Big Brother, or to ask viewers to engage with programming. It’s also a form of creativity that wasn’t available before, and creativity is the first step of everything that makes up television, be it a show or any other element. However, the TV industry knows how to create TV. So my guess is we’ll see more crowdsourcing, and it will affect TV’s future, because it offers an advantage and differentiation. It will definitely spice things up: but won’t replace the main course. > What are the project’s next steps? How close to broadcast is it? The format was completed in July, so we’ve only just finished budgeting the show and pilot. If anything, we need to finish with that one so we can get to the pilot production. As far as broadcasters, we’ve talked to some, but at best, we’ll be set for pitching dates post-MIPCOM. Daniel Ravner is head of digital for Israel’s Armoza Formats. Read his last MIPBlog post here… And meet him at MIPCOM, October 7-10!